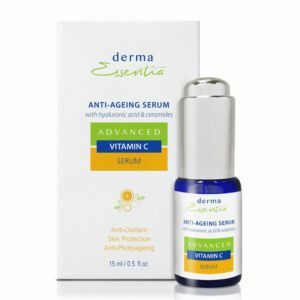 Derma Essentia Vitamin C Serum is formulated with Vitamin C with an added advantage of Hyaluronic Acid (HA) and Ceramides. This serum helps to repair the skin barrier, retain skin’s moisture and skin firmness. Derma Vitamin C Serum contains the pure and stable form of Vitamin C, i.e. Ethyl Ascorbic Acid. The ingredients in Derma Essentia Vitamin C serum are beneficial in multiple ways: Antioxidant Properties: Helps in protection from UV damage Boosts Collagen Production: Helps in reducing fine lines and wrinkles Skin Lightening: Helps to reduce Skin Pigmentation Repairs Skin Damage: Ceramides improve skin barrier function Provides Moisturization: Hyaluronic acid gives skin volume by holding up to 1000 times its own weight in water, binding water to skin for ultimate hydration. 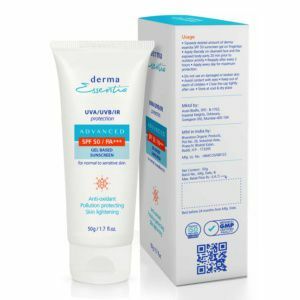 Squeeze desired amount of Derma Essentia SPF 50 Sunscreen Gel on fingertips. It is a unique combo to take good care of skin. Light feel and non-greasy. Suited my skin type!